The Paleo diet made easy! More than 100 main dish recipes for breakfast, lunch and dinner make eating Paleo simple. Focusing on lean animal proteins and plenty of fruits and vegetables, the recipes deliver fresh, natural flavors. 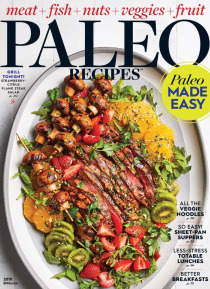 A front of book guide educates the reader about how to transition to a Paleo-friendly pantry and includes a week of menus for easy meal planning.